BOSTON, MA -- The Eastern Hockey League (EHL) just proved once again where it stands in terms of developing its players. Last season, #TeamEHL on the Umass Boston Beacons in the first ever meeting between the league and an NCAA program. Led by a phenomenal effort between the pipes, the group of EHL All-Stars represented the league tremendously well in a 3-2 exhibition loss. Flip over to this season, and #TeamEHL did all that and then some against the Plymouth State and UMass Boston. "I know we competed," said Avalanche head coach and general manager Chris Cerrella. "That was the most important thing for us. We wanted to make sure we went out there each day, each period, each shift and competed with a pair of very good Division III college hockey programs. It proved again that our league produces high-end Division III hockey players. That's important for the people to see, especially for the future recruits to know that we are very good league." Cerrella (New Hampshire Avalanche) served as the head coach this past weekend alongside a trio of assistants in Rich DeCaprio (Boston Jr. Rangers), Mark Catron (Philadelphia Little Flyers), and Bill Zaniboni (Seahawks Hockey Club). It was clear from the drop of the puck against Plymouth State, that this year's team had what it took to represent the league. Despite falling short in each matchup, #TeamEHL was right there with both the Panthers and the Beacons. Looking at the first game in particular, #TeamEHL was tied with PSU for much of the contest, and even outshot their opponent 16-9 in the final frame. Tack on an empty-netter late, and the 3-1 score isn't indicative of how close the game truly was. On the other hand, Saturday's matchup with the Beacons was much more of a high-scoring affair. After falling behind 3-1 early in the 1st period, the EHL All-Stars battled their way back to take a 4-3 lead late in the 2nd period. From there UMB's pressure cranked to a new level, on their way to an 8-5 victory. "No one said we were going to win, or that we even had a chance to win," said Mark Kumpel, the EHL's Directory of Hockey Operations. "The fact that we held our own the way we did however, that is huge for the league. This proves more than anything else that we belong, and that was one of the most important aspects of the weekend." The Eastern Hockey League would like to extend our gratitude to Plymouth State and UMass Boston for the chance to take on their programs, as well as to Southern New Hampshire University and Curry College for hosting our group of young men for tours and recruiting sessions on their respective campuses. This past weekend produced memories that our team will never forget, and on the way out the door from UMB, Wiggle Kerbrat (Avalanche) said it best when asked to reflect on the weekend. 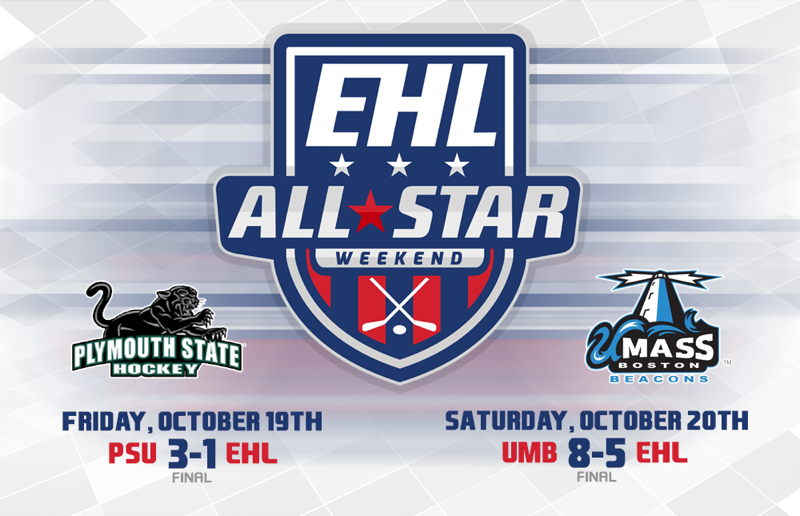 #TeamEHL became just that, a team, in the matter of a few short days this past weekend.